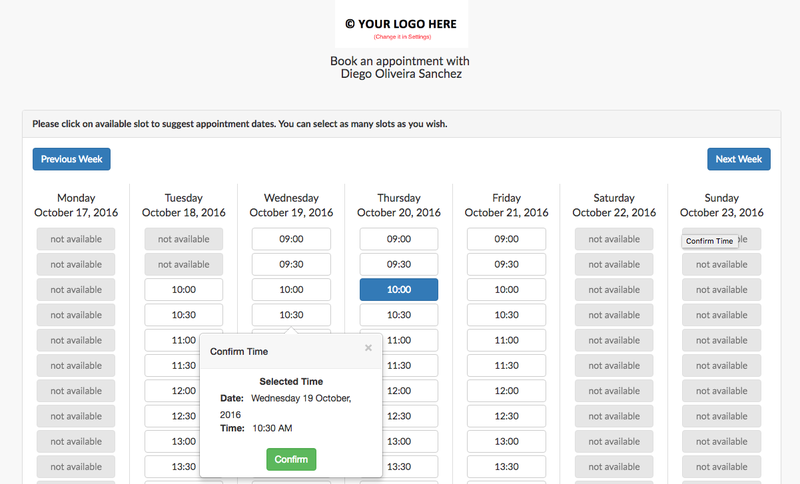 If you want your client to choose an appointment date without back-and-forth calls and emails, you can send them appointment slots. 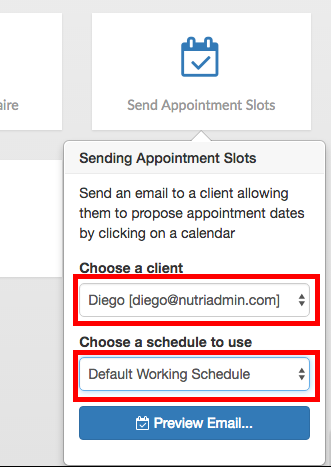 Step 1: In the dashboard, click on Send appointment slots. Step 2: Choose a client, and choose a schedule to use. If you wish to learn how to configure multiple schedules (e.g. if you work at different venues) click here. Step 3: Click on Preview Email. Step 4: You will have the change to view the email your client will see before sending it. You can send it as it is, or your can click on customize text... if you want to make changes. Step 5: When you are ready, press Send. Your client will receive your email shortly. You will be CC'ed in the message as well. 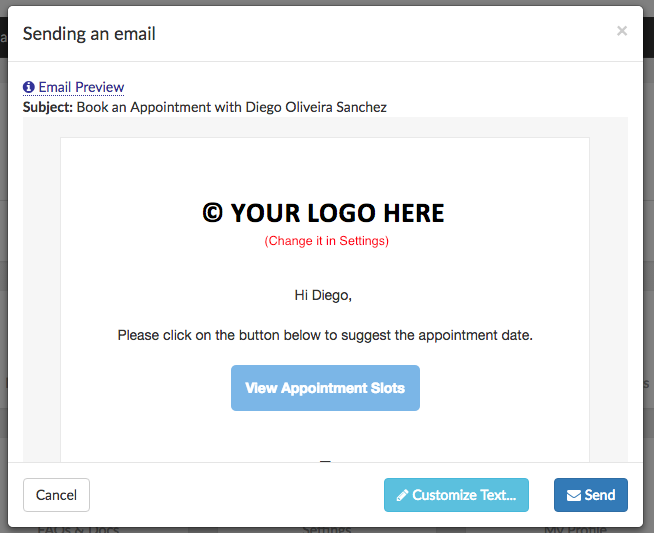 Once the appointment slots email has been sent, your client will have the chance to click on the big blue button in the center of the email to book an appointment with you. The image below shows an example of what your client will see. NutriAdmin takes care of the logistics of determining which dates are available and which ones are not. You are ready to go!. This feature has been designed to help you avoid the headache it can be to manually set appointments, re-schedule them, and go back and forth discussing availability and options. All it takes is for you to click a button to let your client choose which date(s) works for him/her; always taking into account your availability first. 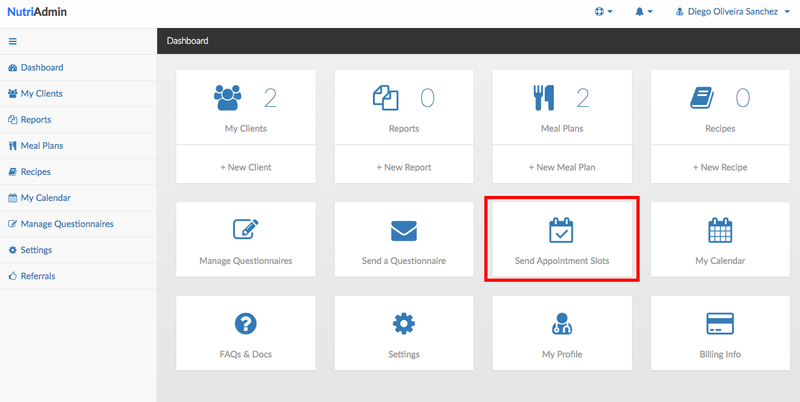 Finally, for the next steps, check out how to review and confirm client appointment suggestions.